The foundation of our work with leaders, teams, and entire cultures are experiential, skill-development workshops. Our communications model that forms the basis of these workshops is framed as “coaching” since it is used to address relationship and performance challenges at work. “The Heart of Coaching” workshops offer a clear opportunity for personal transformation as people shift from thinking and behaving as a boss of people…to thinking and behaving as a coach for people. 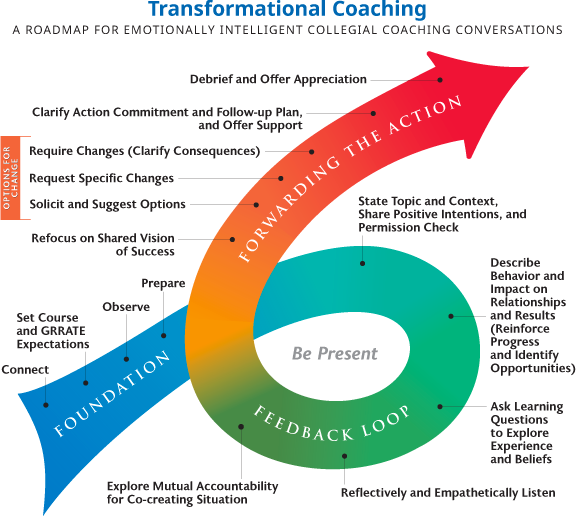 Transformational Coaching is our proven, systematic roadmap for holding emotionally intelligent collegial coaching conversations. This toolkit equips leaders and teams to create egalitarian, mutually supportive, highly accountable, coaching partnerships where feedback flows in all directions—up, down, and sideways—across the entire culture. This “roadmap” for communication becomes a common set of process skills and language that makes everything else easier. Each of the bullets around the loop represent connected skills that are considered options for any given conversation. Rarely would anyone use them all at the same time. The Human Results Cycle, below, is the companion model. It clearly maps the causal impact of each of the 4 elements on one another, and how they all contribute to Results. The connectors of Choose, Accept, Own, and Reflect embed core accountability into both the feedback and coaching portions of the conversation. 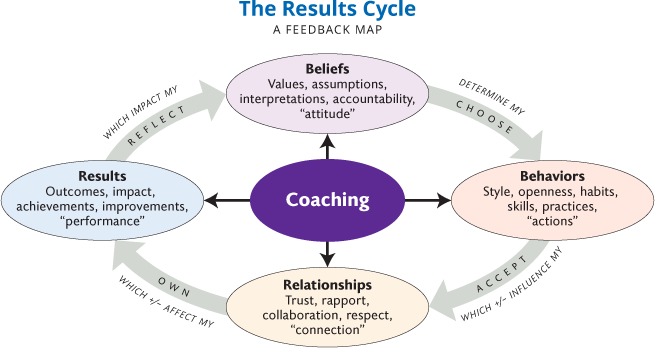 It becomes a map for specific feedback that becomes fully actionable—that is the payoff! 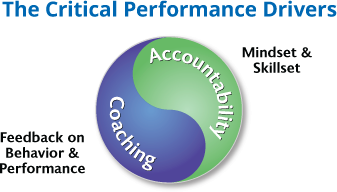 Activated together, coaching and accountability represent the yin and yang of true high performance. They are interdependent and compulsory performance principles. Organizational Accountability is the practice of consciously choosing our thoughts and actions, fully and completely communicating with our colleagues, and willingly accepting the intellectual and emotional ownership for the full impact of our choices. The resulting experiential workshops teach people how to use both of these performance principles to support dramatically transformed interpersonal interactions, which lead directly to sustainable performance improvements. We utilize blended & flipped learning to make better use of the precious workshop time, and “facilitate” these sessions as opposed to presenting as a talking head. Our two-day Core Skills Coaching and Accountability Workshop is robust communication skill development of core material. 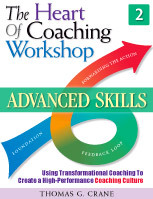 Our Advanced Skills Workshop develops advanced coaching skills over an additional two days. In both workshops, we keep a sharp focus on Implementation: what happens after the workshop. 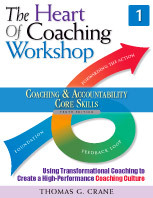 This customizable workshop includes a Participant Workbook and The Heart of Coaching, Fourth Edition. Our more progressive managers learned that this coaching roadmap from The Heart of Coaching could be used in just about everything that related to dealing with employees. The lightbulbs were turning on! We saw the biggest and most positive shifts where managers embraced what it meant to be a coach. They were able to move away from the top-down, command-and-control style to something that was far more engaging and collaborative. Using The Heart of Coaching, team loyalty became tangible, and led to better decision-making and collaboration across the board. A dynamic of trust and faster conflict resolution resulted because personal relationships were cleaned up. And, a measurable reduction in turnover rates had a huge impact on productivity and efficiency.